The following is a list of sites that can help you better navigate the New York State and Federal criminal justice system. 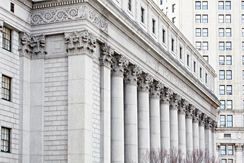 Extensive information can be found here about the courts of New York. This site can be used to track inmates housed in Rikers Island. The Inmate Lookup option will give you detailed information about the inmate. Information about sentenced defendants can be found on this website. The Inmate Lookup link will provide information about the conviction and release date. This site provides public access to information on federal cases. A web based calculator to federal sentencing ranges. This should not be used as a substitute to legal research and legal advice from a professional. A web based calculator to New York sentencing ranges. This should not be used as a substitute to legal research and legal advice from a professional. This is a for-profit site that can be used to add money to an inmate’s commissary fund. Use this site to locate an inmate in federal custody. Successfully overturned convictions on appeal. Successfully argued for reductions of bail. Successfully argued for suppression of evidence. Obtained Acquittals in DNA cases. Obtained Acquittals despite full confessions to police. May, 2013, as posted by Avvo.com.